The invention relates to an analytical support for determining an analyte such as a DNA or RNA target, by carrying out a specific reaction of binding (hybridization) of said analyte with a ligand specific for this analyte, and determining the binding reaction by means of at least two fluorescent labels present on the analyte. This determination is carried out by applying an excitatory field and detecting the fluorescent emission of the various fluorescent labels. According to the invention, the support comprises a substrate coated with one or more layers of material(s) forming an assembly capable of decreasing or increasing the excitatory field for at least one of the fluorescent labels compared to the others. The ligands are attached to the final layer of the assembly. A layer of SiO2 on a substrate of silicon can be used with the fluorescent labels Cy3 and Cy5. where n 1 is the refractive index of the material at the wavelengths λM1 of maximum absorption of the fluorescent label M1, and k is an odd integer, so as to increase the excitation of the fluorescent label M1. 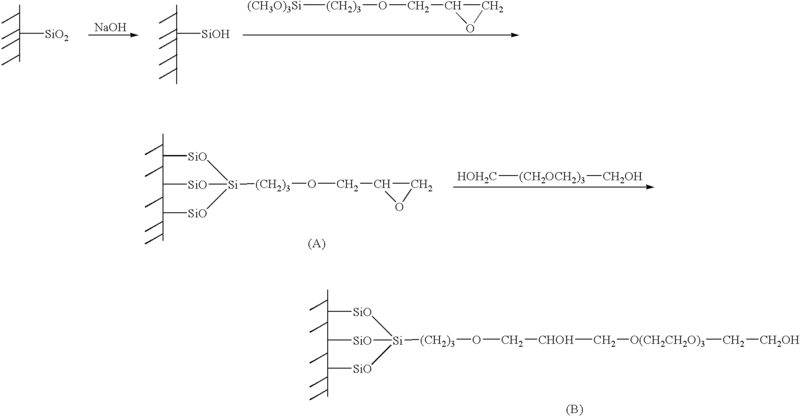 By way of example of a refractory oxide, mention may be made of TiO 2, HfO2, Ta2O5, SiO2 and ZrO2. By way of example of a fluoride, mention may be made of YF 3 and MgF2. When a silicon substrate is used, the layer for decreasing or increasing the excitatory field is advantageously made of silica SiO 2. When the final layer is made of silica SiO 2, this treatment may consist of functionalization with epoxy groups, followed by a reaction with a glycol. Other characteristics and advantages of the invention will become more clearly apparent on reading the following description of examples of implementation given, of course, by way of nonlimiting illustration, with reference to the attached drawings. FIG. 4 represents the evolution of the properties of reflexion (in %) of a multilayer structure in accordance with the invention, as a function of the wavelength. In FIG. 1, curve  1 represents the absorption spectrum of the first fluorescent label Cy3 used in the invention, and curve 2 represents the absorption spectrum of the second fluorescent label Cy5 used in the invention, namely the quantum yields as a function of the excitation wavelength. FIG. 2 represents the calculated evolution of the excitatory fields as a function of the thickness (in nanometres) of the layer of thermal silica SiO 2, when the excitation is performed at the maximum wavelength of absorption of the two labels. In this figure, it is noted that there exist thicknesses of silica which make it possible to decrease the fluorescence of Cy3 compared to that of Cy5, and vice versa. These various analytical supports are then used to determine targets having a sequence complementary to the probes synthesized on the substrate, these targets comprising, in the 5′ position, a fluorescent label consisting either of Cy3 or of Cy5. The fluorescence intensity is then determined for each of the substrates. The results obtained are illustrated in FIG. 3, which represents the fluorescence intensity as a function of the thickness of the layer of SiO 2 (in nm) for Cy3 and for Cy5. a 108 nm-thick layer of SiO 2 (n=1.45). The theoretical and measured responses of this stacking are given in FIG. 4, which illustrates the evolution of the optical properties of reflexion (in %) as a function of the wavelength λ (in nm). Curve  1 refers to the theoretical values and curves 2 and 3 refer to three experimental tests, curve 2 illustrating two tests for which the results are too close to produce the two curves. 1. Analytical support for determining an analyte by carrying out a specific reaction of binding of said analyte with a ligand specific for this analyte, and determining the binding reaction by means of at least two fluorescent labels present on the analyte, this determination being carried out by applying an excitatory field and detecting the fluorescent emission of the various fluorescent labels, said support comprising a substrate to which is attached a plurality of ligands specific for the analyte to be determined, said substrate being coated with one or more layers of material(s) forming an assembly capable of decreasing or increasing the excitatory field for at least one of the fluorescent labels compared to the others, and the ligands being attached to the final layer of the assembly. 2. Support according to claim 1, in which the material(s) and the thickness of said layer(s) are chosen such that the signals emitted by the various fluorescent labels are equilibrated. 3. Support according to claim 1 or 2, in which the analyte to be determined is a DNA or RNA probe and the ligand is the complementary DNA or RNA probe. 4. Support according to any one of claims 1 to 3, in which the material(s) of the layer(s) capable of decreasing the excitatory field for one of the fluorescent labels is a refractory oxide, a metal fluoride or a silicon oxynitride. 5. Support according to claim 4, in which the refractory oxide is chosen from TiO2, HfO2, Ta2O5, SiO2 and ZrO2. 6. Support according to claim 4, in which the metal fluoride is chosen from YF3 and MgF2. 7. Support according to any one of claims 1 to 6, in which the substrate is made of a semi-conductor material, of glass or of plastic material. 8. Support according to any one of claims 1 to 7, suitable for the use of at least two fluorescent labels. 9. Support according to claim 8, for which the first fluorescent label is Cy3, the excitation wavelength of which is approximately 550 nm and the emission wavelength of which is approximately 580 nm, and the second fluorescent label is Cy5, the excitation wavelength of which is approximately 650 nm and the emission wavelength of which is approximately 680 nm. 10. Support according to claim 9, in which the layer is made of SiO2 and has a thickness of approximately 100 to 1 000 nm. 11. Support according to claim 10, in which the substrate is made of silicon. 2) in attaching to the final layer formed on the substrate the ligands required for determining the analyte. 13. Method according to claim 12, in which the ligands are attached to the final layer via spacer arms.